Elite Screens MaxWhite Screen Material is durable for daily use and Easy to Clean, it has wide viewing Angle with 1.1 Gain, suitable for most application including Business Presentation, Home Theater Movie and Education Training. MaxWhite Screen material make in Black Back to block light from behind and also Texture pattern to ensure there is no Moir or Hot Spot (Hot spot issue happen on most shiny no texture material, like white board or flat wall). Warning: Cancer and Reproductive Harm - www.P65Warnings.ca.gov. 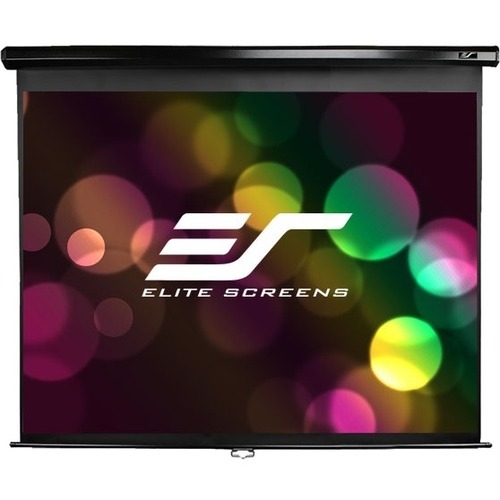 Elite Screens® Manual series is key for professional video presentations for your home or office. The Manual series features the Greenguard & Greenguard GOLD certified, 1.1 gain, MaxWhite® projection screen material. This 4K Ultra HD ready screen not only provides the widest possible viewing angle with perfect diffusion uniformity but also retains precise definition, image color reproduction, and black/white contrast. The Manual series arrives within a sturdy steel case in your choice of black or white finish, and it easily installs to wall or ceiling for a solution that does not get in the way. The incredibly easy to use auto-locking component allows for variable height settings, making it a highly versatile projection screen. Since 2004, Elite Screens® has become a global leader in projection screen manufacturing through its headquarters in the US and branch offices in Europe, Japan, Australia, India, Taiwan, and China. With a focus on superior product and service, Elite Screens® is dedicated to making projection screens for any projection environment. Ask about Elite's 2-year warranty and 3-year ENR-G enhanced warranty.